This breastplate is made entirely from 18 gauge steel. It is offered in one size, fits up to a 46 inch chest, and given its 18 gauge construction, it can be gently bent to adjust its size to fit most with ease. A full torso design that covers the entire front, from the neck, down across the shoulders, leaving space for the arms to move, and around the sides, down to the waist with a riveted brass cross on the front that possesses stylized fleur de lis terminals at each of the four ends. Attached at the shoulders and sides of the breastplate are leather straps. True breastplates reappear in Europe in 1340 first composed of wrought iron but latter steel. These early Breastplates only covered the upper torso with the lower torso not being protected by plate until the development of the Fauld around 1400. Around 1450 the Breastplate had expanded to cover the entire torso and could consist of one or two plates. 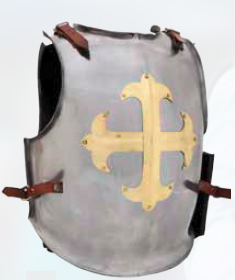 Worn by countless soldiers from many cultures such as the English, French, and Spanish, this Cuirass was designed with the Templar Knight in mind. This page was last modified on 6 November 2013, at 15:48.